Sakai Guides and DocumentationSakai Complete User Guide MessagesHow do I determine who site participants can send a message to? This feature gives the option to regulate each role's message composing permissions. Permissions is located below the Course Site title. Check the corresponding boxes for desired permissions. Permissions are assigned on a role-by-role basis. 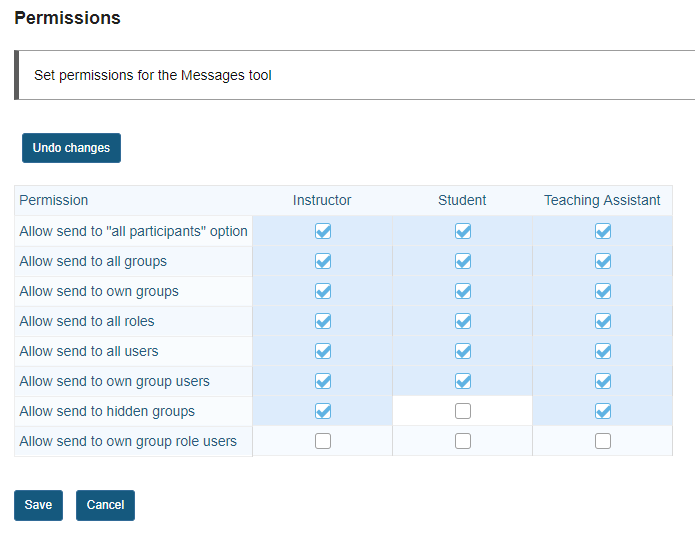 For instance, to prevent a student from sending a message to "All Participants", un-check the Student Permission box located next to the option, "Allow the 'All Participants' options to the 'To' field." Note: These options will be visible when clicking the "To" text box in Compose a Message, within the Message tool. Click Save or Cancel to quit. Prev: How do I modify the settings for Messages? Next: What is the News tool?